When the Blue Sky Cellar reopens on Jan. 28, don’t miss the walls. Yes, I said the walls of Blue Sky Cellar. 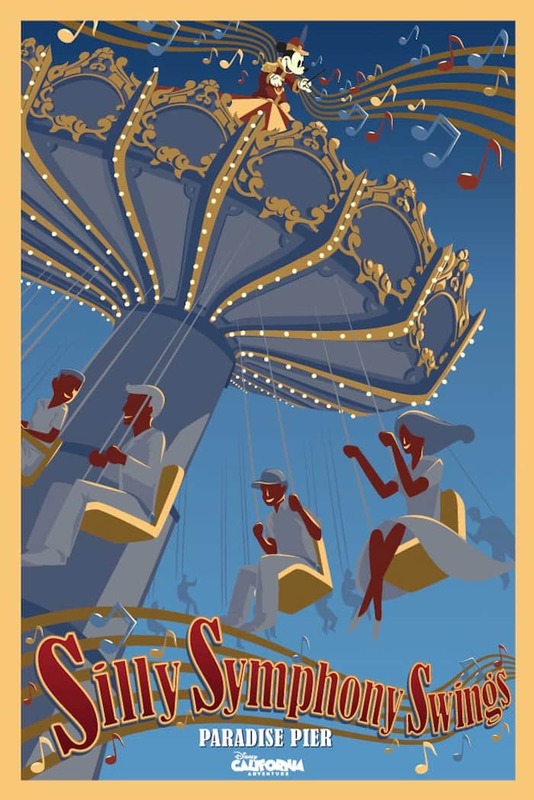 Nestled among the expansion updates, you will find new attraction posters from the boardwalk of Paradise Pier, including California Screamin’, Silly Symphony Swings and Mickey’s Fun Wheel. These posters will also be available for purchase. Watch for release dates and retail locations at www.ArtofDisneyParks.com. The posters are part of a rich tradition within Disney Parks worldwide – a tradition that dates back to 1956 and the original park, Disneyland. In the summer of 1956, Disneyland was about to enter its second summer. 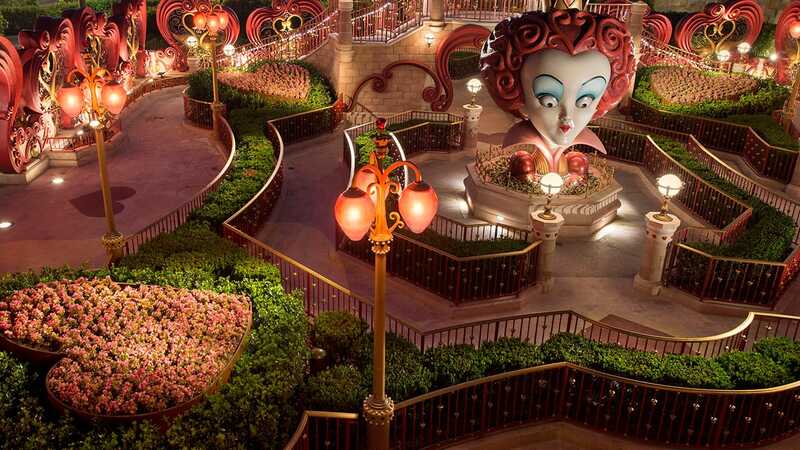 Most people had little knowledge of what Disneyland really was, and they knew even less about the attractions inside the park. According to an upcoming book, “The Poster Art of Disney Parks” by Walt Disney Imagineering’s Danny Handke and Vanessa Hunt, the posters were a fast, clear and visually attractive way to convey an image of each attraction. 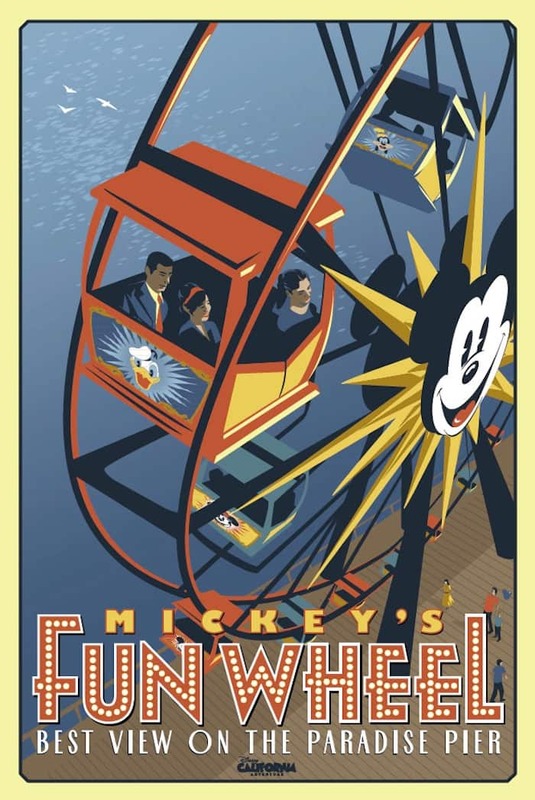 Over the years, the style of the various attraction posters has come to reflect the time period in which they were created, as well as the tone and visual palette of the attractions and themed land where they were located. 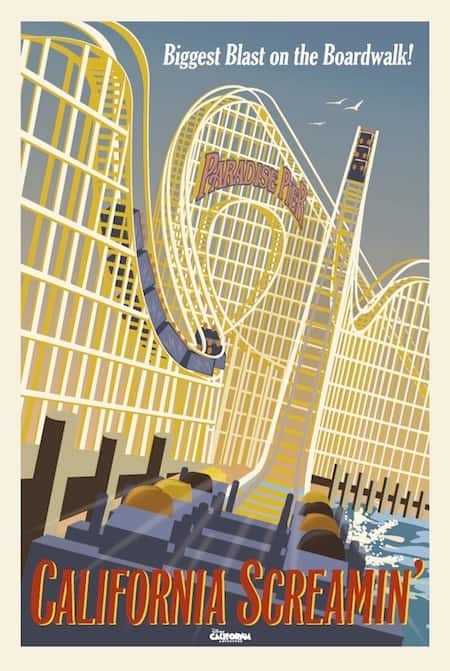 This tonal tradition is carried on in the latest series of posters featuring the Paradise Pier attractions. With a nod to the classic travel poster aesthetic, the new attraction sequence graphically conveys the excitement and character of each Paradise Pier attraction. This newly released artwork is the first of several scheduled attraction art releases. Additional series releases are scheduled within months of the initial Paradise Pier series. The first California Adventure attraction posters will be available at retail locations throughout the park on Jan. 28. Are you familiar with the Disney Parks attraction posters? Let us know if you have a favorite among the hundreds that have been created over the years. I’ve been waiting and waiting to buy these posters. Where can I get them? HELP! @Gregory – Critter Country is only closed temporarily. Hungry Bear Restaurant will re-open March 9 and Splash Mtn in May. Very exciting!! However, I was disappointed when I called Disneyland Merchandise Guest Services today who said stores were not yet carrying them in the park–and in fact hadn’t even heard of these! My fav is the classic Matterhorn attraction poster. I don’t see any place on that site to purchase online. I have a wall and a stack of frames ready for my next trip to Disneyland when I plan to buy lots of posters, but it would be great if I could get them online, (easier than flying them home.) Where can we buy these and other posters online? These are very cool. The posters will be welcome additions as they are the kind of traditional elements that DCA has kinda lacked. Would love to see future posters for GGR, Soarin’ and especially the Tower of Terror! Is Critter Country closing starting today or all the rumors wrong? No love for Golden Zephyr? What a good idea ! I really like Disney Parks Poster and I would like to buy one of those but unfortunately, in France at Disneyland Paris, they don’t sell any Attraction Posters … Hope I will be able to find one in WDW this summer ! Great idea! But is it too late to shift all of the attraction titles to the top of the poster? You know… like the vast majority of the original Disneyland attraction posters? Having the name at the bottom isn’t as aesthetically pleasing to me. Very nice! I love the nostalgic travel-poster look. You should seriously consider putting them on display at the entrance as a sort of “preview,” the way Disneyland does. 1) Jungle Cruise (fave ride, ‘nuf said). My favorite 3 attraction posters have to be Splash Mountain, Pirates of the Caribbean (the one where the pirate is wearing blue), and the Haunted Mansion. Great rides, great posters! Does anyone know how these can be purchased? Still available as print-on-demand posters in the parks? How much they cost? I am SOOOOOOO excited about these posters. I want one of each FOR SURE. These are perfectly retro awesome. I didn’t know about the tradition of posters at Disneyland! 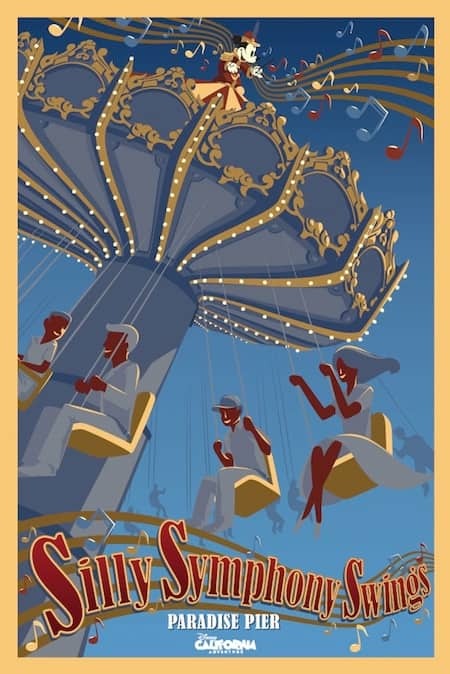 Now I want one…thinking the Silly Symphony Swings. Thanks for the info and for the history lesson–love it! Love these posters. I’m looking forward to the companion set from Grizzly Peak, GRR, and Redwood Creek Challenge Trail (my favorite area of DCA). Great news. Glad to see the practice of poster art continue. I have ten original silk-screened posters from Disneyland that I treasure. Will the original 2001 California Adventure posters be offered for sale as well? Some of those are really nice as well. Great posters! I’m glad to see that Disney is finally treating DCA like a real Disney park. My favorite poster is probably the WDW (or Disneyland) Railroad poster. It’s so detailed, and just captures the spirit of the Railroad in the park, and how important it was in not only Disneyland, but the entire Disney Company. As for the book… I can’t wait! It’s sure to be chalk full of amazingness from Past and Present! I like these DCA posters, and am looking forward to maybe buying them. I want to see a poster for World of Color and the Mermaid ride! I love the retro look of those posters, and I’m looking forward to the new exhibit in the Blue Sky Cellar. Even though there are a lot of construction walls at California Adventure right now, at least they look good. I am the LUCKY recipient of an original Pirates of the Caribbean attraction poster, the same one you pass on your way into Disneyland Resort. It was among some other “sale” art about 15 years ago in the old Disney Gallery. Once I realized what I had, I had it framed under glass and it is PROUDLY displayed in my guest room. LOVE IT! I love all the “retro” artwork popping up around the park: these posers, the Disney characters on the construction walls, the Cars construction walls. Very cool. Seems like a silly post. Stay tuned for the Cellar, but you can see them here… But I thought I was going to the cellar to see them? @Mickey: The Maliboomer has been/is being removed from the park. It’s be kinda silly to put together a poster for that now (I still wouldn’t mind seeing one, of course). I love these attraction posters. I plan on making a Disney-travel themed guest bedroom when we purchase a house next year. These are definitely going in it along with many of the old attraction posters. They look pretty nice, but its hard to tell with such small images. My favorites would have to be the Disneyland Monorail (old style) and Tomorrowland ’94 at the Magic Kingdom. Whoa, when is the poster book out? I’ve been wanting something like that for years. The poster art has always been some of my favorite Disney art,especially the Small World “Happiest Cruise” poster. Can’t wait to see a book FULL of poster art…sounds fabulous!